The only tool to manage and secure SharePoint and Office 365 applications. Software developers know better than most how important trust is when it comes to selling their own apps, solutions, and add-ins. Take the business-to-consumer (B2C) market – consumer trust in a piece of software can dive bomb immediately if the customer suspects their personal data may be used in ways they’re not happy about. The same goes for the business-to-business market: if one of your clients has any reason to lose trust in you or the solutions you build, expect them to terminate the contract fast. Developing trust involves more than just clever marketing and big claims about the security, sustainability, and effectiveness of your software. Smart customers will want more than impressive homages to your tool. Instead, they want hard proof that your product is great and that it won’t damage their company, their SharePoint environment or their reputation. And this isn’t just about being cautious – research from Gartner has shown that 75% of mobile applications downloaded from app stores by enterprise users would fail basic security tests. So, if you want to prove to potential customers that your apps, solutions, and add-ins offer not only great user experiences but are also safe, secure and follow best practice, what should you do? Until now, there’s been no universally recognized way of testing the quality of code or the quality of the process employed to create those solutions. 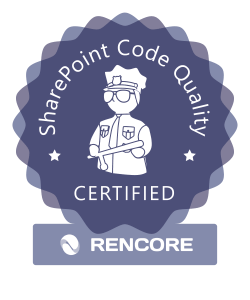 At Rencore, we really believe in bringing transparency into the SharePoint and Office 365 development process, and so are very excited to announce our new certification program. By providing a standard for you to test your SharePoint solutions., add-ins and apps, you give your customers confidence that your products have passed the highest industry standard tests. What does the certification program involve? Our program will provide you with a certificate to show your customers that they can trust you. It provides them with additional confidence in your products and means they’ll have fewer worries about investing in your products. The certification will also help your developers continually work towards improving your internal governance procedures and maintain standards. Of course, not all of these categories apply to all software; you may have designed a system which is intentionally not interoperable with other platforms. We do, therefore, apply the certification with some flexibility. We also recognize that for our method to be trusted and viewed as legitimate, we needed independent third parties to review and critique our own tests – something we have already done and will continue to do as the number of partners who have completed our certification continues to grow. So, what does a Rencore certified partner look like? Among the first companies to have completed our certification is Lightning Tools. With international offices in Florida, the UK, and Australia, Lightning Tools develop awesome products that have helped their customers get maximum return on their investments in SharePoint and Office 365 since 2007. We then applied our rigorous analysis to their existing products, apps, add-ins and web-parts. The good news: Lightning Tools passed with flying colors. This means their customers can have additional confidence knowing that by deploying Lightning Tools products, they’re not going to damage their environments or put them at risk in any way. They also know that Lightning Tools will be constantly updating their tools to ensure they stay up to date with latest best practice and never get left behind. Are you confident in your products? So, do you think your customizations and add-ins would pass the most rigorous tests for code quality and development process best practice? 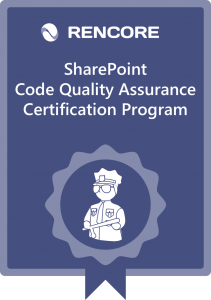 Visit our Rencore Code Quality Assurance Certification program page today and submit your portfolio for our objective, independent analysis of code quality. Discover problems you may not have known you had and boost customer confidence in your proposition. Try SPCAF today and help ensure your business remains safe, secure and trustworthy for your clients.